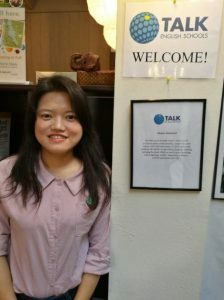 Yen-Ting Chao joined the ESL study program at TALK San Francisco in 2017 and leaves with excellent language skills and many fond memories. Cindy Chao, also known as Yen-Ting, and as she prepares to return to her home country of Taiwan, she looks back on her study period in San Francisco, Cindy has a lot of great advice that she has drawn from her experience. The Key to a Successful and Memorable ESL Study Program in the U.S.A.? But don’t take our word for it … read Cindy’s advice and recollections of how to make the best of your ESL study program in the USA. “Hi, I’m Cindy, a student at San Francisco’s TALK English School. “If you like sunshine, you should choose California! If you want to stay in a safe and convenient place, you might be satisfied. “If you want to improve your English and meet some excellent teachers in the US, I’m very sure TALK School in San Francisco will be your best choice and you won’t be regretful. You can learn everything here – not only English speaking, listening, writing and reading, but also American culture. “I think everyone who comes to America to study English, the most eager thing you will feel is that you want to experience and learn about American culture: how to communicate with native speakers, how to find a good restaurant or cozy guesthouse by using Yelp or Airbnb, even when you are in trouble how to deal with or what to avoid. “You need to ask questions about anything that makes you confused or worried. I believe teachers here are so very glad to help you. “BUT … what I most want to share you are the special and exciting activities held here. All activities are given lots of thought and planning. At the monthly potluck lunch, you can share information about your culture, about the traditional foods in your country. And you can try multiple kinds of foods from different countries. “Field trips here that you must experience. I went to Los Angeles, not only to Universal and Hollywood, but also attended a TV show. We learned about workings of a film shoot. You could watch movie stars very clearly and if you are lucky, you can face-to-face talk with them and ask for signatures. “I loved the activities in and around San Francisco, especially riding a bicycle from Pier 39 to Sausalito by crossing the Golden Gate Bridge. “I already have a lot of good memories that I will not forget. And I believe those wonderful memories will become an essential nutrient to make me mature. Thanks, Cindy. We loved having you and we could not have said it better. You learned so much, and it’s great that you shared.